If memory serves, there are very few scenarios that can top the wonder of the night before Christmas–unless, of course, it’s told from the Nutcracker’s perspective. 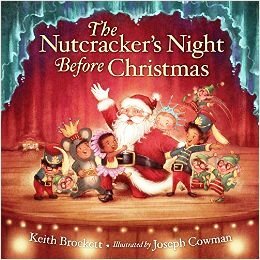 That’s exactly how this memorable night unfolds in author Keith Brockett’s latest oversized picture book for grades 1-3, The Nutcracker’s Night Before Christmas. In this familiar end-of-the-year tradition with a twist, some eager and well-meaning children have worked hard to present their version of The Nutcracker. The play is to debut on Christmas eve, but unfortunately everything goes wrong: the Mouse King’s sword is missing, an angry cat rips the tutus to shreds, and somebody prints the programs with a glaring typo: The Nutcracker is misspelled as The Nutsmacker. Any elementary school teacher/school play director will tell you that a scenario like this where the play has gone wrong, the children are in tears, and the stage looks like a hurricane just blew through it, is a nightmare to beat all nightmares. 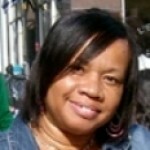 Thankfully, all is not lost. Since it’s actually the night before Christmas, Santa is making a local toy drop and swoops by to save the day. This is one of the most delightful Christmas-themed books to appear in recent years, and if it were to become a Christmas classic, no one would be surprised. Mr. Brockett’s prose is not only laugh-out-loud funny, it’s pleasingly precise in rhyme and meter. In fact, it sports a Seuss-ish quality that many children’s writers have tried to mimic without much success. Artist Joseph Cowman’s illustrations are rich, detailed, vibrant, and charmingly reminiscent of Christmases (and Christmas disasters) from days gone by. This book should bring a smile wherever it is shelved, be it an elementary library, a family bookshelf, or the crowded story time area of a popular bookstore.